Based on a majority of reviews, people admired how comfortable the Nike Air Foamposite One felt on the feet. One user said he loved the comfort so much he that he copped all the colorways. Many stated how stylish they thought the shoe was, with one buyer saying that the shoe was a definite eye-catcher. Several consumers said that the colors look much more vibrant in person, especially in the sunlight. They further mentioned that the colors go with most types of clothes. One user said he thought the metallic red colorway was ‘dope’ while another mentioned the goldposite as a head-turner. A number of those who reviewed the shoe were pleased that it was easy to clean. Some testers reported that the shoe gave excellent ankle support. A few people observed that the Air Foamposite One’s soles had good traction. A couple of individuals stated that the 3M laces were the ‘cherry on top’ of an already good thing. Most reviews mentioned that the shoe runs small and narrow. The breathability of the Nike Air Foamposite One received many negative feedbacks. Several testers felt that the shoe was too heavy. A few complained about the quality of the shoe. Four users stated that the shoe they got had multiple glue spots all over. Some consumers observed that the shoes were quite expensive. One person was unhappy that the yellow colorway of the shoe was not as opaque as it seemed and you can see right inside the shoe. 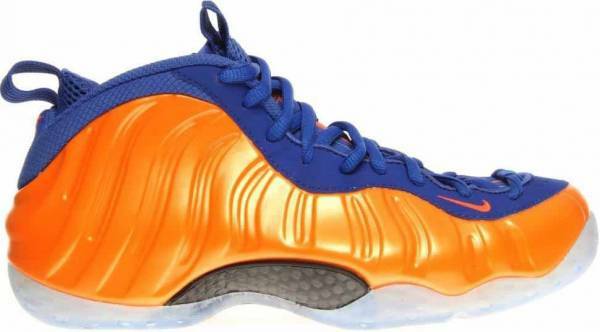 The Nike Air Foamposite One is not an affordable shoe, but it does make up for it with comfort and style. The shoe’s design is arresting and unique. Although the shoe runs narrow and small, most feel that this could be remedied by going up a half to a full size higher. Once buyers get the right size, the shoe feels perfectly snug and cozy on the feet. The finishing leaves something to be desired, but with exceptional ankle support and vibrant colorways, the sneaker still seems like a good deal. The Nike Air Foamposite One first debuted in 1997. The original colorway was a dark neon royal blue. It quickly became Penny Hardaway’s signature shoe and was one of the priciest basketball shoes of that era. It had a futuristic look and was made up of a seamless liquid Foam mold, carbon-fiber midfoot plate, and a Zoom air unit. It looked bulky, and the masses did not warm up to it at first, but it has over time, turned into a cult classic. The Air Foamposite One’s idea came from a molded sunglass case made of EVA foam. Eric Avar, the lead designer of the Air Foamposite, says they wanted to create a seamless shoe that would conform to the feet just like the case did to the object inside it. The design, on the other hand, was inspired by a beetle’s exoskeleton. It took them three years to create a shoe just like the one they envisioned. In 2007, after ten years from its initial debut, The Air Foamposite One was again released in its original colorway as well as in Black/Anthracite, Black/Red, and Black/Cactus. A year later, a very rare colorway named Dark Army was released by House of Hoops. During 2009, the now iconic Eggplant colorway was released. It came back out in 2010 along with the Copper and Cough Drop colorways. A tribute pack to Penny Hardaway designed by Sole Collector dropped in 2011, with an astronomical price tag of $1,000. The year 2012 saw a lot of new colorways being released. It was also the year that marked the start of the Foamposite madness where one guy even offered his car in exchange for the very rare Galaxy colorway. Another notable colorway released during this year was designed in collaboration with Laika Studios to promote the movie ParaNorman. It had bright green soles and a smoke print on the shell. An embroidered “Weird Wins” can be seen on the heel. Year on year since 2012, several colorways of the shoe dropped, including printed ones such as the Weatherman. It wasn’t until 2014 when the black and red Supreme versions were released that pandemonium, such as in the time of the Galaxy, reigned again. Vast numbers of fans gathered in one of Supreme’s store location, causing the in-store release to be scrapped and the shoes sold online instead. This 2017, Nike celebrated the 20th anniversary of the Air Foamposite One by revisiting classic colorways and releasing retro renditions. They will also release a new edition in November called Legion Green. Meanwhile, a new color called Abalone is planned for the spring of 2018. Sneaker fans should not be daunted by the Nike Air Foamposite One’s contemporary look. This shoe goes well with most type of casual clothes including shorts, jeans, and black joggers. The Nike Air Foamposite One is available in men’s sizes which range from 7 to 15, with some half sizes offered as well. The shoe runs small and narrow, so buyers are advised to go up a half size to a full size bigger. No dimensions for women yet but a women’s exclusive Air Foamposite One will be released in December of this year. The Air Foamposite One features a Foamposite upper which helps mold the shoe to the wearer’s foot. It also utilizes a polyurethane midsole and the Zoom Air-Sole technology for responsive cushioning. An inner bootie gives the shoe a sock-like feel, and a translucent outsole made of rubber provides it durable grip. The Air Foamposite One first debuted on the feet of NBA’s Mike Bibby. It is one of the most-sought after retro shoes.